AT&amp;T Savings has put together a list of the 50 most popular toys and games from the 1990s, and looked at Google Shopping trends over the previous year to determine which toys were the favorites in each state. If you were a kid in the 90's, chances are you remember Polly Pockets and Hot Wheels. AT&T Savings has put together a list of the 50 most popular toys and games from the 1990s, and looked at Google Shopping trends over the previous year to determine which toys were the favorites in each state. Remember getting pelted by your younger brother's Nerf gun? Here in Arizona, that's apparently the most popular toy in the state. Nationwide, other popular 90's toys are Heeley's, American Girl dolls, Easy-Bake Ovens, and Barbies. Another part of the list shows how much each of these toys sell now, if you were to look for them on eBay. Nickelodeon's Floam is selling at a whopping $120. If you're an Arizonan, or used to be in the 90s, you can pick up a Nerf Gun on eBay for about $40. 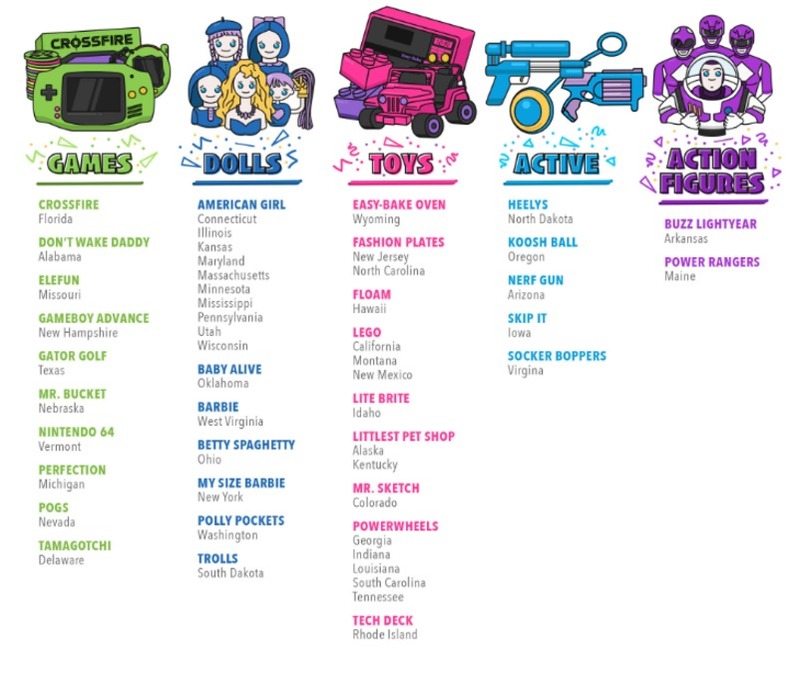 You can check out the full list of favorite toys by each state at attsavings.com .